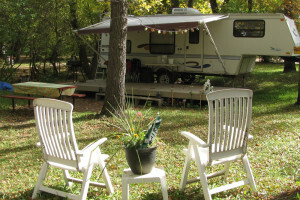 All campsites have picnic tables & fire pits. Please use trash cans and and Loraas bins available throughout the campground for garbage. Drinking water is available from central taps and firewood is available at a cost per bundle. Shade trees abound, in fact, at some of the farther non-electrical sites you feel as though you are in a deep forest. Washroom facilities range from old fashion biffies to modern shower house with flush toilets.